Last Thursday, Tobu Tower Sky Tree and Tobu Railway unveiled the official character for the Tokyo Sky Tree, which is scheduled to be opened in spring 2012. This adorable character is named “Sorakara-chan.” Sorakara means “from sky” and chan is suffix for familiar person. She wears star-shaped hairstyle and cross-striped dress just like the Sky Tree. Characteristic: When something good happens or when she makes wonderful discovery, the star on her head shines. Treasure: The telescope her grandpa gave to her. Dream: Meeting people from all over the world at Tokyo Sky Tree. 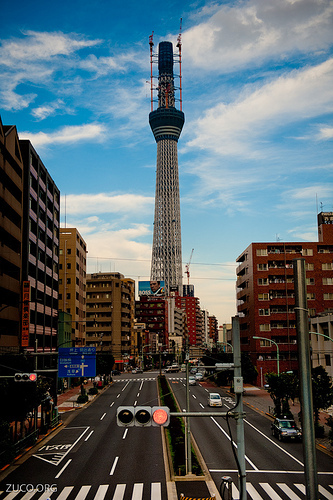 Supposedly, Sorakara-chan was watching the Earth from “Tongari-boshi (Sharpy Star)” and found Tokyo Sky Tree. Because she was so curious about it, she flew to Tokyo! Since Japanese people love “kawaii (cute)” characters, Sorakara-chan will be a strong magnet for them. It was announced that Sorakara-chan goods such as stuffed doll, tote bag, and figure will be released in the future.